Flo Kitchen Cleaner is a modern and effective spray that removes contamination from all washable surfaces. The liquid perfectly copes with typical stains that occur in the kitchen. The special Pro Active foam formula creates active foam, thanks to which the liquid effectively removes persistent fat and dirt. At the same time, the product remains gentle on the cleaned surfaces, leaving no streaks or scratches on them. The spray is suitable for a variety of materials, such as glass, ceramics and stainless steel. 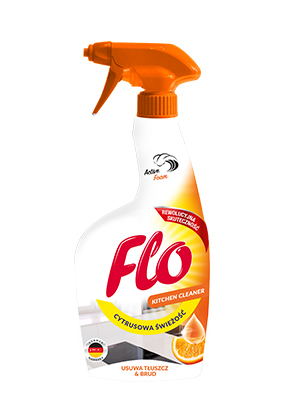 Flo Kitchen Cleaner has a pleasant, refreshing citrus scent that leaves the aroma of cleanliness in the kitchen. The product does not contain phosphates. The agent for cleaning the kitchen Flo Kitchen Cleaner was made on modern installations covered by the integrated quality and environmental management system ISO 9001 and ISO 14001. Directions for use: Spray the cleaned surface and leave for 30 seconds. Then use a sponge or cloth to clean the surface. After using the liquid, rinse the surface with water intended for consumption. Recommendations: Preparation for direct use. Before use, check the function of the liquid on the invisible part of the surface being cleaned. The product can be used to clean alkaline-resistant surfaces. Note: Irritating to eyes. cleaning of stoves, glass, ceramics, kitchen worktops, stainless steel.